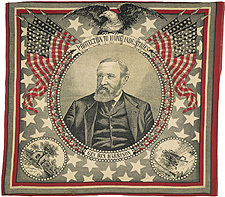 H. Thomas Hickerson is co-director of the Political Americana Project. Hickerson is Associate University Librarian for Information Technologies and Special Collections in the Cornell University Library. His special collections responsibilities include oversight of the Library's principal rare book and manuscript programs, and he directed the Division of Rare and Manuscript Collections from 1992 through 1998. His information technologies role includes direction of the Division of Digital Library and Information Technologies, with general responsibility for library systems operation, digital library development, and electronic publishing. He was founding director of the Cornell Institute for Digital Collections (CIDC) and continues to oversee its activities. Tom is presently Vice President/President Elect of the Society of American Archivists and was honored for his professional contributions by being named a Fellow of the Society in 1987. He has also served on the Executive Committee of the ACRL Rare Books and Manuscripts Section. In 1993, he was the recipient of an Andrew W. Mellon Research Fellowship, Digital Access to Research Collections on College and University Campuses, and he has written and spoken extensively on archival and library automation and digital library development. Elaine Engst is co-director of the Political Americana Project. Engst is Director of the Cornell University Library Division of Rare and Manuscript Collections. She coordinated the Cornell component of the Title II-C project to create and implement the USMARC AMC format in RLIN, and for her work on the New York State Historical Documents Inventory, she was awarded SAA's C.W.F. Coker Prize for outstanding finding aids. She has participated in the Division's digital projects, coordinating Cornell's component in the Kodak Library Image Consortium (KLIC), directing the creation of the Fuertes database, curating the Ezra Cornell exhibition, and advising on the Utopia and MESL projects. Michele Hamill is Paper and Photograph Conservator with the Cornell University Library Department of Preservation and Collection Maintenance. She obtained her MS in Art Conservation at the University of Delaware/Winterthur Museum where she also received training in the care, storage and handling of objects, textiles, paintings, and furniture. Prior to her arrival at Cornell, Hamill was a Senior Paper Conservator at the Library of Congress and a Consultant and Senior Paper and Photograph Conservator for the State Historical Society of Wisconsin. She is a Professional Associate of the American Institute for the Conservation of Historic and Artistic Works. David Louis Jones is Digital Imaging Specialist with the Cornell University Library Digital Consulting and Production Services. David has 14+ years of experience and knowledge in graphic design, digital imaging/photography and color management systems. His background also includes work experience and research in digital photography, digital video production and pre-press desktop publishing. David also provides design and technical support for DCAPS' many web based imaging projects and databases. Jones previously worked at Time Warner Cable's Syracuse Division (Ithaca) and with EMV Inc. in Cortland, NY. He has Bachelor of Arts degrees in Fine Art/Studio Painting and Modern Dance from the State University of New York at Potsdam. Kurt A. Jordan worked as Political Americana Project Archivist for the Cornell University Library Division of Rare and Manuscript Collections from February 2002-June 2003. He received a Ph.D. in Anthropology (archaeology) from Columbia University in 2002. Prior to his arrival at Cornell, Jordan co-directed the Townley-Read/New Ganechstage Archaeological Project in Geneva, New York, and spent four years with the Congressional Research Service in the Library of Congress. He has been involved in historical material culture collections research, management, and cataloging since 1992.